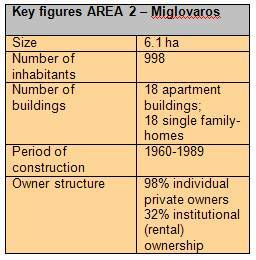 Both target areas, Lieporiai as well as Miglovaros, are predominately characterized by the standardized multi-storey apartment buildings from the soviet time. 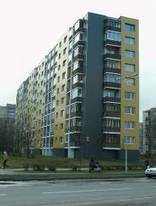 Meanwhile Lieporiai is a typical major-housing estate with neighbourhood related schools, park area and shops for the local supply, the target area Miglovaros is a smaller pure residential area. The two target areas were selected on one hand because they are very typical regarding their structure and the experiences in the target areas can be used as samples for further municipal activities regarding the develop of approaches for the modernization of the “soviet planning legacy” in the city. On the other hand there are active communities and NGOs in the target area that could be a favourable factor to promote the modernization process in the area. 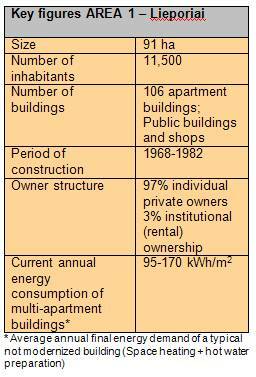 The residents of both target areas started with own activities to enhance the energy efficiency of the buildings. However, these activities vary widely in terms of quality and complexity and are mainly focused on apartment-related measures. Activities that require a general structural change or activities of the entire house owner community are rarely applied. For this reason the general refurbishment rate is still very low – as in the entire municipality of Šiauliai – and there is the urgent need to prepare integrated concepts for a holistic overall upgrading of the two neighbourhoods that take into account a common design and an integrated approach. Those concepts are the precondition for the implementation of National Programme of Refurbishment of multi-storey buildings. Both areas are connected to the central heating system of the city. However, the heating grids are in poor condition and there are high energy losses up to 40 percent. Due to the losses the price for district heating is very high. Residents as well as the energy supply company are very reluctant about the introduction of renewable energy sources. A major challenge of the upgrading activities in both neighbourhoods is to enable the different house owner communities to start with own coordinated refurbishment activities. For this reason it is necessary to provide adapted technical and financial solutions. The major objective of the project in Šiauliai is to assure the sustainable and integrated development of the two target areas. For this reason the city supports on one hand the thermo-modernization of the building stock and of the energy supply system. On the other hand it carries out accompanying measures to improve the living environment of the two target areas. Both activities are coordinated in a holistic way in the two neighbourhood related integrated urban development concepts (IUDC). The IUDC becomes a binding document (approved by the city council) that has to be considered at all public and private construction and renovation activities. As a precondition for further upgrading activities as well land property issues are addressed within the project. Solutions are developed to clarify the property rights of the related area in the surrounding of the buildings which has not been so far part of the land titles of the apartment owners. Special focus of the enhancement of the living environment is the quality of the public space, playing grounds and the Lieporiai park. Additional the supply with public transport, parking space, infrastructure for disabled persons is improved and the cycleway network is extended. To encourage the enhancement of the energy efficiency the city provides owners with information about financing possibilities and adequate technical approaches for the specific situation in the different building types. For this reason the city organises energy saving days and meetings with the heads of the housing communities.